The past week’s flat and listless SILVER and GOLD PRICES woke up today, like a giant refreshed with wine. The GOLD PRICE leapt $22.90 (2%) to $1,137.00 while silver gained 75.1 cents (FIVE POINT TWO PERCENT) to $15.257. Clearly, the shorts panicked. They’ll think twice before they short silver and gold prices again. On the longer term chart what happened? Silver dropped today to the bottom of its 2-1/2 month range at $14.36, then when that employment report came out exploded upward through the top of that range, through the downtrend line from the April 2013 high, through $15.00, and all the way to $15.25, not too far from the $15.44 September high. 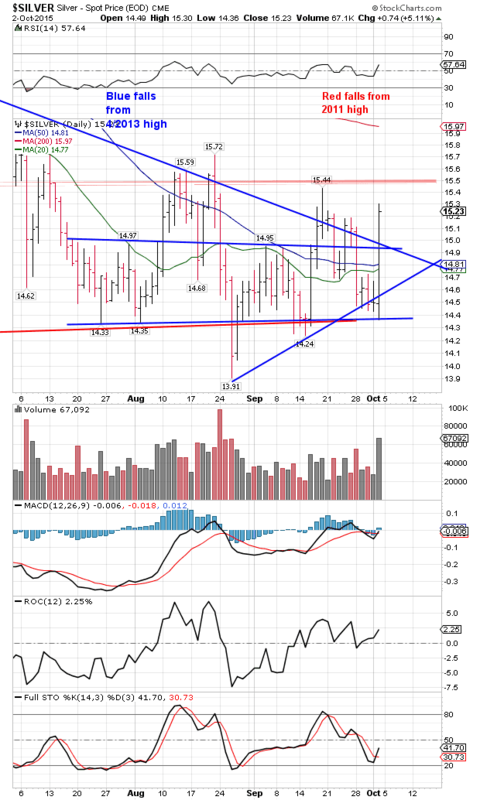 This is a superb showing, vindicating the SILVER PRICE uptrend from the August low, and breaking out of an even-sided triangle. $15.50 is now the target. Silver’s pulled on her seven league walking boots, and can leap that little step in a single bound. The GOLD PRICE today before the labor report sank through that even-sided triangle’s boundary, but whoa! What a turnaround. Shot straight up, sliced through the 50 DMA and 20 DMA and kept sprinting for the upper triangle boundary. Didn’t quite make it, but closed at the doorstep of that $1140 resistance and just under the downtrend line from the January high. It’s crouching on the doorstep, waiting to batter down that door next week. First, think about this: Like cheap magicians, the media pander to our native distraction by details, bogging us down in the day to day fidgety minutiae, keeping our eyes off the horizon so that we are easily misled. No matter what the details and how compelling and significant they seem for the moment, NEVER take your eyes off the Big Picture, the Horizon, The Explanation For It All (well, with limited application of that last one). Behold, the picture before your eyes: the government/central bank partnership capstoned by the US Federal Reserve system in 1913 breaking down. Dying of its own excess, like an old drunk. With it is dying government control of the economy, and while its demise may not at first issue in real freedom but in dictatorship, that paroxysm, too, will quickly pass. The simple truth is that socialism, whether it favors the Party apparatchiki or the banks and corporations, simply doesn’t produce the goods. In quantity it can only produce misery and death. In the shorter term, confidence in the Fed (and other central banks) and especially the US dollar continues to erode. Considering the 70-year old iron hegemony the dollar has wielded over the global economy, its replacement, however slow or fast, will ground colossal changes. Gold and silver and those who own them will benefit. The week’s scorecard doesn’t show the tremendous moves today. Looks like silver and gold flatlined or fell, while in truth they staved off another attack and recovered stoutly. 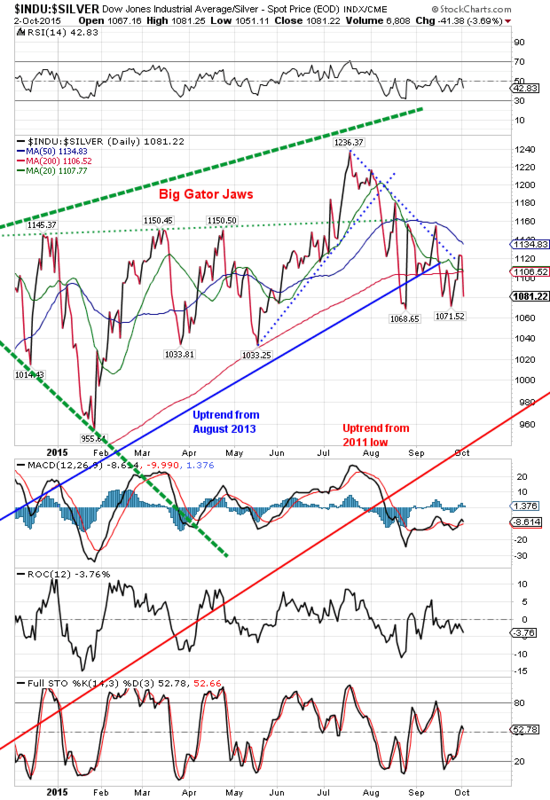 Stocks staged a fishy recovery today, and the US dollar is badly wounded and bleeding. 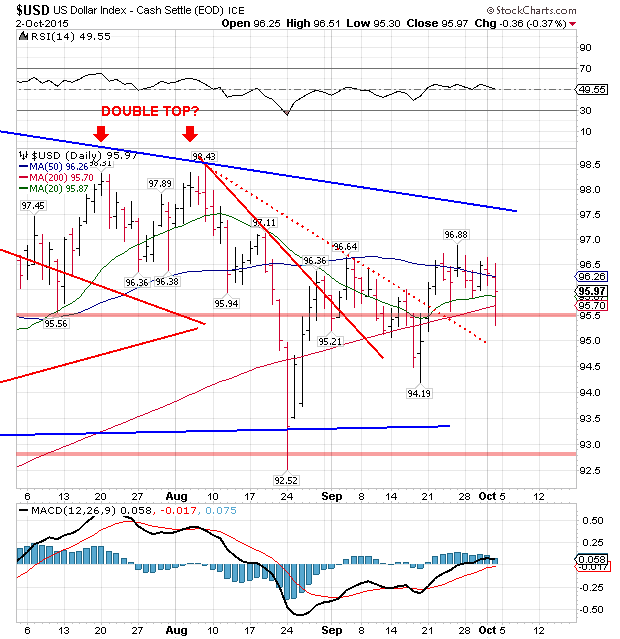 The lying government employment report was published at 8:30, and it torpedoed both stocks and the dollar. The consensus expected 200,000 new jobs, but only 142,000 were reported. As usual, last month’s report was also adjusted way down. Labor Force Participation rate stands at 62.4%, its lowest since 1977. That means that of all the adults of an age to work, only 62.4% are working. Whether the rest are gone fishing, on disability, tired of working, or what, we don’t know. The markets’ logic went like this. Mother Janet has been promising to raise the interest rate if employment picked up, so when employment tanked, markets sold stocks and the dollar. 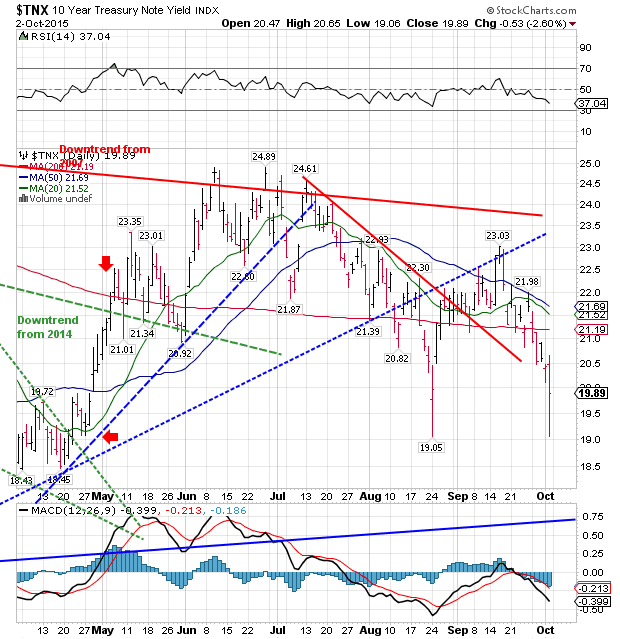 Dollar tanked because interest rates are the prime determinant of exchange rates, AND the dollar began rising July a year ago on all Mother Janet’s promises to raise interest rates. Speculators piled on, and piled on, raising the Dollar to lofty heights, but when the Big Day came in September, Mother Janet and the rest of the professors blinked. Dodged. Blew all their credibility. Dollar index fell in one straight line from 96.30 to 95.22. Oddly, oddly — Do I smell government fish? — it recovered during the day to close at 95.97, down only 36 basis points instead of 108. Makes no never-mind, still closed below 96. Broken. Euro gained 02% to $1.1214 and Yen lost 0.7% to 83.33. Both tried to break out of triangles, but failed, no doubt pushed over by their respective Nice Government Men. In the Currency Race To The Bottom, nobody wants a strong currency. Goofs. After plunging 200 points on the employment report, stocks astonishingly found friends about 10:15, friends with DEEEEEP pockets wanting to spend big bucks, and that buying drove the Dow up 200.36 (1.23%) to 16,472.37. S&P500 jumpt 27.54 (1.43%) to 1,951.36. Where does that leave ’em? Still in a corrective reaction in a MASSIVE downtrend. Yes, both closed above their 20 day moving averages, both closed near the top of their range. 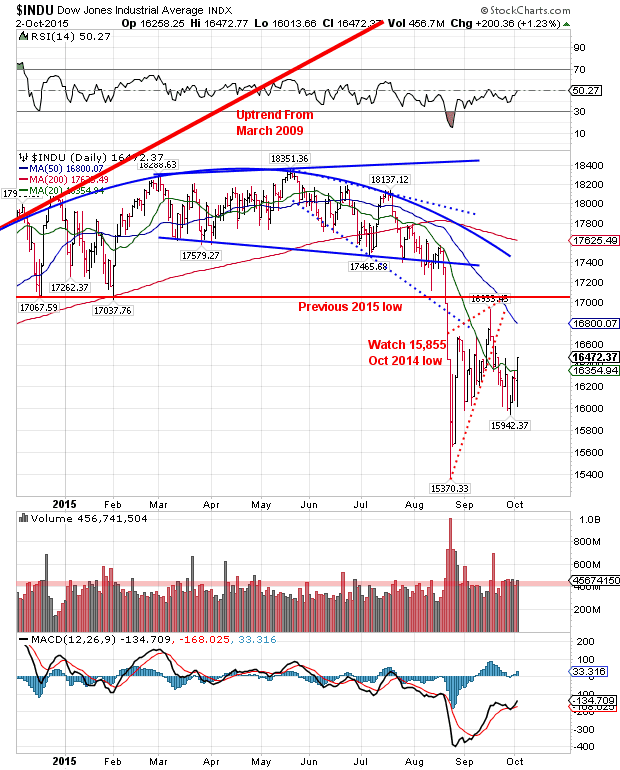 Both are still dead men walking, not even within walky-talky range of the 200 day moving average above their heads. 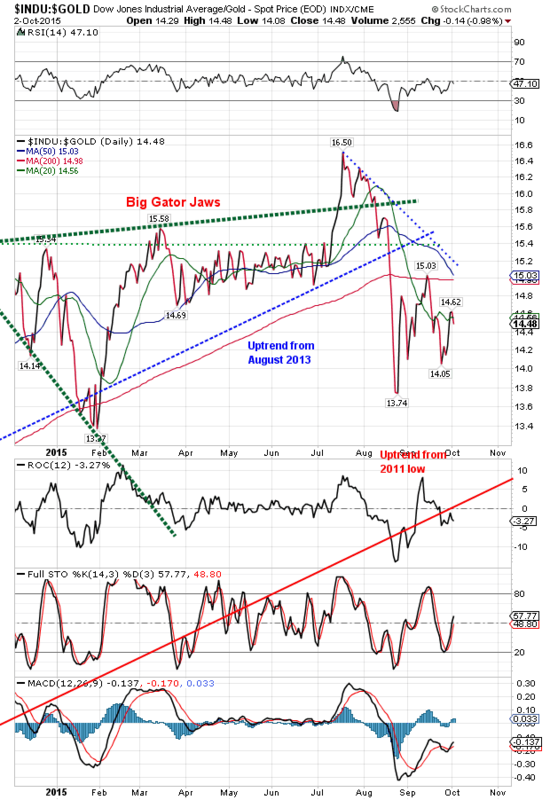 Underscoring stocks’ sorry plight are the Dow in Gold and Dow in Silver. Even with stocks up strongly today, both indicators hooked down, and the Dow in Silver sank far beyond its 200 DMA. It closed 1,081.22 troy oz. against a 200 DMA at 1,106.52. Dropped 41.38 oz today, 3.69%. Dow in gold was already far below its 200 dma (14.98) and closed today at 14.48 oz. Next down leg, which has probably started, is REALLY going to hurt.